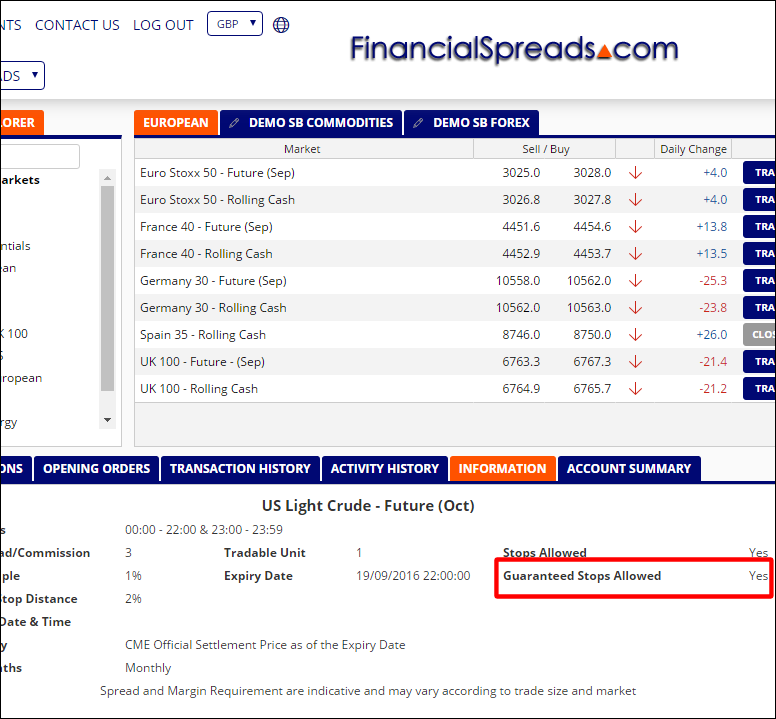 To help with your risk management, Financial Spreads lets you add orders to your spread bets and CFDs. We automatically add a normal Stop Loss order to all new opening trades. Note, if you would like to opt out of these, simply ask Customer Support to update the settings on your account. For added security, you can make your normal Stop a Guaranteed Stop Loss order instead. 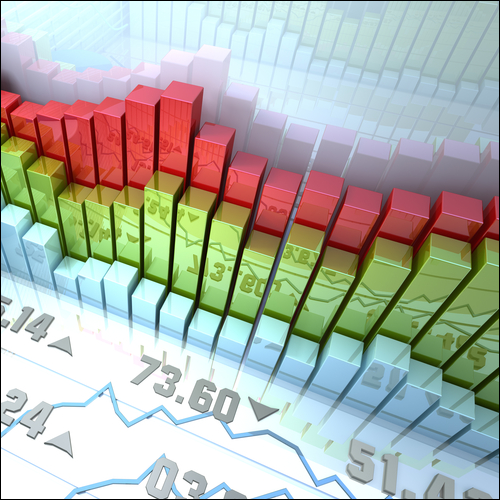 Why Use a Guaranteed Stop Loss Order? A Guaranteed Stop Loss will help protect your downside when the markets gap, or slip, between price levels. Note that gaps are more likely to occur with volatile markets, illiquid markets or between the time that a market closes and re-opens. E.g. our UK 100 market could close on a Friday at 6,600 and then re-open on the following Monday at 6,450. If so, the market will not have at traded all the levels from 6,600 down to 6,450. It will simply have 'gapped' or 'slipped' from 6,600 straight to 6,450. Therefore any normal Stop Loss orders set to be executed between 6,600 and 6,450 would actually be executed at 6,450. A Guaranteed Stop Loss ensures that your order is executed at the level you specified irrespective of any market gaps. As mentioned above, we already add a normal Stop Loss to your trades. Again, a normal Stop Loss order does not guarantee the level where your trade will be closed if the market gaps. For example, let's say that you buy the UK 100 at 6,800, and you set your Stop Loss at 6,750. Should the UK index 'gap' and fall straight to 6,710, then your Stop Loss would close your trade at 6,710, rather than at 6,750. This is because the stock market index didn't trade at 6,750. The next price that the market traded at was 6,710 and therefore your position would be closed at 6,710. However, if you used a Guaranteed Stop Loss order and set that at 6,750 then with the same market movement your order would be filled at 6,750 rather that 6,710. So even though a Guaranteed Stop comes with a small extra cost, it can save you money. With this example it would have saved you 40 points (minus 3 points for the cost of the order on a market like the UK 100). You will only be charged the Guaranteed Stop fee if your order is triggered. If you add a Guaranteed Stop to your trade and the trade is closed before it hits the Guaranteed Stop, e.g. manually by you or by hitting a Limit order (aka Take Profit order), then you are not charged the Guaranteed Stop fee. There is a small premium you have to pay for making your normal Stop Loss a 'Guaranteed Stop Loss' (again, this is only paid if the order is triggered). The cost is typically 3 x your stake for popular markets like the UK 100 and EUR/USD. E.g. if you are trading EUR/USD for £2 per point then the charge for a Guaranteed Stop on EUR/USD is 3 x £2 = £6. The potential cost is shown on the trade ticket before you trade e.g. see the red box in the trade ticket screenshot above. For a breakdown of charges by market, please see the table below. Guaranteed Stop orders need to be placed further away from the level of your opening trade than a normal Stop Loss. E.g. as per the table below, the closest you can place a Guaranteed Stop on a UK 100 trade is 1% (where the percentage is based on the underlying market). Therefore if the UK 100 is at 6755 then the closest you can place a Guaranteed Stop to your trade is 68pts (1%) away. The minimum distance is shown in the table below and also in the 'market information' on the trading platform. Naturally you do not need to calculate the minimum distance. You can move the Guaranteed Stop further away if you have the funds to cover your trade. Above data accurate as of 8 August 2016. Example 1) A Guaranteed Stop order on gold costs 5 x your stake. If you are trading £2 per point then the charge for a Guaranteed Stop on gold is 5 x £2 = £10. Important, this is only charged if your Guaranteed Stop order is triggered. There is no charge if your order is not triggered. Example 2) The Germany 30 has a Minimum Guaranteed Stop Loss Distance of 1% so if the Germany 30 is trading at 10,600 then the closest you can put your Guaranteed Stop to your trade is 1% away, i.e. 106pts away. Again, the platform will calculate this for you. 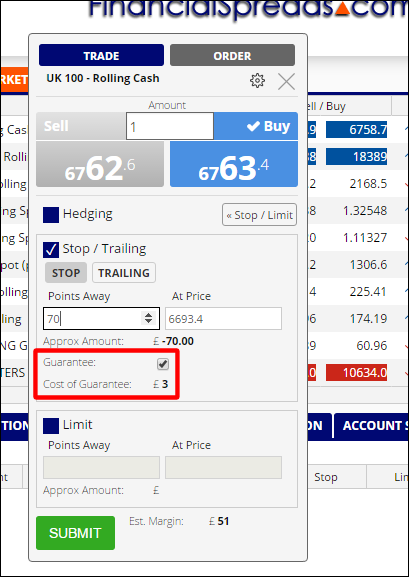 If a market is enabled for Guaranteed Stops then you can add one via the trade ticket. Your Stop Loss will now be a Guaranteed Stop. As with a normal Stop Loss you can still update the level of your Stop. If you are setting up an Order to Open, i.e. setting an order to open a trade when the market hits a certain level, then you can also add a Guaranteed Stop to it. If you now place your Order to Open and it is executed then the Stop Loss on this trade will be a Guaranteed Stop. You can use Guaranteed Stop orders on most, but not all, markets. You can also check if you can add a Guaranteed Stop for a particular market. This is shown in the market information on the platform, e.g. in the red box in the screenshot below. There will be certain times when the market being traded will not allow you to add a Guaranteed Stop Order. During these times the tick box on the trade ticket will be displayed but it will be disabled. E.g. a Guaranteed Stop Order cannot be placed on any market outside its normal market hours i.e. a UK share before 08:00 or after 16:30.